Heel lifts are a great way to either increase your height or to correct leg length discrepancies in one easy, comfortable and discreet method. 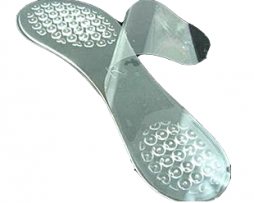 Heel lifts are new, innovative and inexpensive, the simplest way to appear taller and improve your self esteem. Our heel lifts are designed to be both comfortable and offer support to tired ankles and lower limbs. Many people, for whatever reason, feel insecure with their own height and would love to have the extra confidence a few inches would add to their lives. Thankfully you no longer have to live with these feelings and with the simple addition of our heel lifts a whole new confident perspective on life can be waiting for you. Stretching exercises and a healthy diet are superb lifestyle choices and will help improve posture and height, to a certain extent, when the body is still growing through puberty. However, when the body naturally stops growing these exercises, as good as they are, will only have a very limited effect on height despite what many other sites will say. The easiest and most effective way is to simply use an invisible but hugely successful method of appearing taller, a method that even your nearest friends or family will never be able to spot or even guess you are using, the heel lift. Heel lifts can be used to increase your height by up to 3 inches and, due to their simple graduated design, this increase can be done gradually and imperceptibly by slowly adding further layers inside your shoe or in one complete step. Whichever method you feel happiest with, the result will be the same, you will feel comfortable and confident with your new look. Because you are able to simply adjust the height of the heel you are in total control of your own height, by simply removing the layers or adding more you can find the height that you are most comfortable with. Comfort is a priority with our heel lifts and they have been specifically designed to make sure you can wear these lifts all day without any aches or pains to the heel or ankle joints. They provide support and comfort to the foot, holding the heel in a more natural position. Being made from a lightweight shock absorbing cool gel our heel lifts offer a comfortable in-obtrusive all day alternative to expensive elevator shoes that are often very heavy and have a harsh jarring effect on the ankles and heel. Another advantage of the gel heel lift is that they can be easily transferred from one of your favourite pairs of shoes to another, you need never be without that extra height and comfort whenever you need it as these heel lifts will fit almost all styles and sizes of shoe. Heel lifts can also be used to adjust leg length discrepancies, please do consult a qualified specialist first, and Achilles Tendinitis. The cooling effects of the gel mean your feet will be comfortable all day and are less likely to swell in warmer weather or when walking longer distances. Dual Layer System for easily adjustable height gain. Gain up to 40mm or 1.5 Inches, you control the height you want to be. Helps to correct differences in leg length.